2011 Nissan Murano SL Leather, Navigation, Loaded, #T-13628AA $ 13,977 LOW MILES! NOW NOW NOW Was $15,977 Was $15,977 Was $15,977 RustyWallaceToyota.com RustyWallaceToyota.com RustyWallaceToyota.com 423-587-1972 423-587-1972 423-587-1972 5944 4 West t A.J. . Hwy. • M . • Morristown 5944 West A.J. Hwy. • Morristown www.RustyWallaceToyota.com www.RustyWallaceToyota.com www.RustyWallaceToyota.com www.RustyWallaceToyota.com www.RustyWallaceToyota.com www.RustyWallaceToyota.com www.RustyWallaceToyota.com www.RustyWallaceToyota.com www.RustyWallaceToyota.com www.RustyWallaceToyota.com www.RustyWallaceToyota.com www.RustyWallaceToyota.com ©SMTPUB INC 2014 Honda Pilot EX-L 4x4 Sunroof, 3Rd Row, #P-9299B $ 22,977 LEATHER! NOW NOW NOW Was $25,977 Was $25,977 Was $25,977 2015 Ford Edge SE All Power, Super Clean, GREAT PRICE! #N-13463A $ 18,977 AWD! NOW NOW NOW Was $20,977 Was $20,977 Was $20,977 2017 Toyota Corolla IM SAVE THOUSANDS! Warranty, #T-13508C $ 16,977 NOW NOW NOW Was $17,977 Was $17,977 Was $17,977 WARRANTY! 2015 Toyota Sienna XLE AT, All Power, Warranty! #P-9276A $ 26,977 SEATS 7! NOW NOW NOW Was $29,977 Was $29,977 Was $29,977 Auto, PW, A/C, Ultra Clean, ONLY 53K MILES! #P9279B 2016 Honda Accord EX-L Coupe, Auto, Warranty! #T-13361C $ 18,977 LEATHER! NOW NOW NOW Was $19,977 Was $19,977 Was $19,977 * Prices plus tax & tag. Prices include $499 Service & Handling fee. ** Limited Powertrain Warranty. Some vehicles are for illustrational purposes only. 2015 Toyota Avalon XLE Warranty, AT, All Power, #N-13332A $ 24,977 LUXURY! NOW NOW NOW Was $25,977 Was $25,977 Was $25,977 2015 Toyota Corolla S Plus $ 14,977 6 SPEED! NOW NOW NOW Was $16,977 Was $16,977 Was $16,977 Nav., All Power, 27K, Navigation, #P-9218A 2015 Chevy Colorado LT 4x4 Crew Cab, Super Low Miles! Leather, Nav., #N-13283B $ 27,977 LOADED! NOW NOW NOW Was $29,977 Was $29,977 Was $29,977 2017 Ford Escape SE AWD, All Power, $AVE Thousands! #T-13556A $ 18,977 LOW MILES! NOW NOW NOW Was $20,977 Was $20,977 Was $20,977 2014 Toyota Avalon XLE Touring Auto, Leather, Sunroof, Nav., #T-13814 $ 18,977 MINT! NOW NOW NOW Was $20,977 Was $20,977 Was $20,977 2014 Toyota Prius C Hybrid All Power, Sweet Miles! Warranty! #N-13467AA $ 12,977 50 MPG! NOW NOW NOW Was $14,977 Was $14,977 Was $14,977 2017 Nissan Altima S Auto, All Power, $ave Thousands! #P-9316A $ 15,977 WARRANTY! NOW NOW NOW Was $16,977 Was $16,977 Was $16,977 2016 Hyundai Sonata Sport Auto, All Power, Ultra Clean, $ave! #T-13781A $ 14,977 SHARP! NOW NOW NOW Was $16,977 Was $16,977 Was $16,977 2015 Ford Focus SE Leather, Sunroof, 16K, #N-13257A $ 13,977 LIKE NEW! NOW NOW NOW Was $14,977 Was $14,977 Was $14,977 2012 Jeep Wrangler Auto, Nav., Call of Duty Pkg., #T-13737A $ 23,977 4x4! NOW NOW NOW Was $25,977 Was $25,977 Was $25,977 2015 Cadillac SRX Leather, Roof, Low Miles, #T-13343A $ 22,977 CREAM PUFF! NOW NOW NOW Was $23,977 Was $23,977 Was $23,977 2015 Kia Soul + Auto, All Power, Alloys, #P-9273A $ 13,977 SWEET MILES! NOW NOW NOW Was $14,977 Was $14,977 Was $14,977 2010 Toyota Rav4 Auto, All Power, Alloys, Low Miles, #P-9268D $ 11,977 4x4! NOW NOW NOW Was $12,977 Was $12,977 Was $12,977 2014 Dodge Ram SLT 4x4 Crew Cab, 28K Miles, V8, Hemi, #T-13928A $ 26,977 4x4 NOW NOW NOW Was $27,977 Was $27,977 Was $27,977 2016 Nissan Murano AWD, All Power, Low Miles, $ave! #P-9263A $ 22,977 WARRANTY! NOW NOW NOW Was $24,977 Was $24,977 Was $24,977 2014 Ford F-150 XLT 4x4 Leather, 31K Miles,w #T-13816A $ 29,977 4x4! NOW NOW NOW Was $31,977 Was $31,977 Was $31,977 2006 Toyota Tundra X-Cab, Auto, Sweet Truck! #T-13995A $ 9,977 SR5! NOW NOW NOW Was $10,977 Was $10,977 Was $10,977 2014 Ford Fusion SE Auto, All Power, Super Clean, #P-9288B $ 11,977 30+ MPG! NOW NOW NOW Was $12,977 Was $12,977 Was $12,977 2015 Scion tC 6 Spd., Sunroof, Alloys, #T-13685C $ 12,977 30+ MPG! NOW NOW NOW Was $13,977 Was $13,977 Was $13,977 Auto, PW, A/C, Ultra Clean, ONLY 53K MILES! #P9279B $ 11,977 11,977 11,977 $ YOUR CHOICE YOUR CHOICE YOUR CHOICE MINT! 2011 Ford Ranger XL Leather, V8, Sunroof, Navigation, Super Sweet Miles! #T-13595B 2008 Jeep Commander Overland 4x4 LOADED! www.Claytonhomesofmiddlesboro.com US Hwy 25E Middlesboro, KY • 606-248-4800 HOMES ©SMTPUB INC ©SMTPUB INC Factory Outlet Save Thousands! 865-428-1978 MeadowsHomes.com Sevierville , TN YEARS 2017 1987 30 Your Tri-State Connection November 8 - November 14, 2018 Volume 31 • Edition 45 ©2018 The Smoky Mountain Publishing, Inc. Your Weekly Bargain Connection! 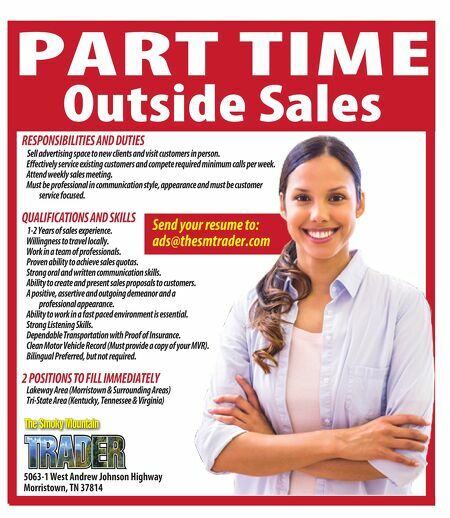 ©2018 The Smoky Mountain Publishing, Inc. Weekly Weekly www.thesmtrader.com Priceless ads@thesmtrader.com (423) 587-1700 (423) 587-2906 Hours: Mon. - Thur. 9:00 AM - 5:00 PM 5063-1 West A.J. 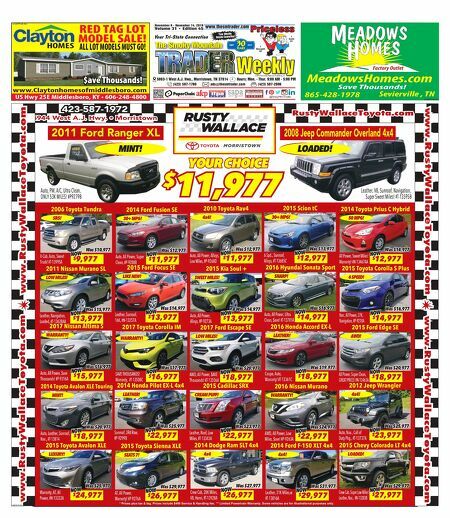 Hwy., Morristown, TN 37814 @SmkyMtnTrader ALL LOT MODELS MUST GO! $ave Thousands! $ave Thousands! $ave Thousands! RED TAG LOT MODEL SALE!